Over the past several months, fear-mongering elements within the financial media have raised the specter of a bubble in energy-focused master limited partnerships (MLP), a popular security class among retail investors seeking above-average yields, tax advantages and exposure to the US energy renaissance. In this installment of Energy Investing Weekly, we examine the validity of these claims, highlight some of the bigger-picture risks to the MLP party and emphasize the importance of looking beyond distribution yields to the potential risks and rewards embedded in your portfolio. Our conclusions: On the whole, underlying fundamentals appear supportive of further price appreciation and distribution growth within the MLP space, though investors should understand the potential risks embedded in the individual names that they own. Valuations and gradually rising interest rates could set the stage for some profit-taking in the near term, especially on the year’s big winners. 1. Blowing Bubbles in MLP Land? With memories of the tech and housing bubbles fresh in their minds, nothing strikes fear into the heart of investors like the thought that irrational exuberance toward a particular asset may have inflated the price beyond its intrinsic value. In the worst-case scenario, investors are left with only air when the bubble pops. However, those who exit during the inflationary stage can book real profits. The key is identifying and heeding signs of weakening fundamentals–easier said than done, especially with the emotional attachments that we develop with winning trades. Some have cited The recent upsurge in initial public offerings (IPO) of MLPs as sign that a bubble could be forming in this space. Certainly, investors should conduct an appropriate level of due diligence before sinking their money into one of these debutants. 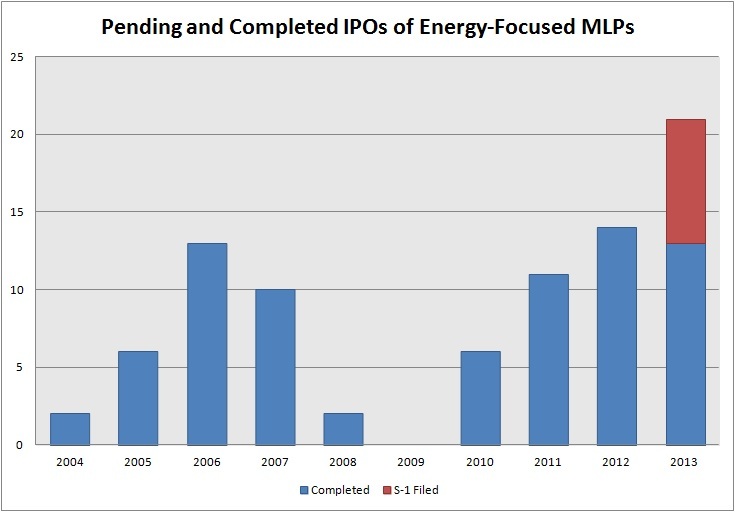 Energy-focused MLPs have completed 13 IPOs thus far in 2013, putting the security class within striking distance of a new annual record. With eight additional names having filed their S-1 registration statements with the Securities and Exchange Commission, the number of MLP IPOs could hit 17 or 18 this year. 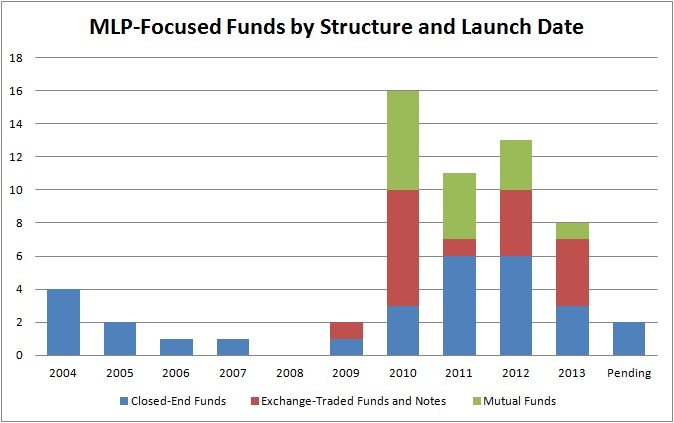 Moreover, as we noted in MLPs Remain Popular Way to Monetize Energy-Related Assets, the pipeline of prospective publicly traded partnerships should remain robust in the coming year, as private-equity outfits and traditional C corporations seek to take advantage of the security class’ growing institutionalization and appeal to individual investors. The uptick in MLP IPOs in and of itself doesn’t indicate that a bubble has formed. That being said, the quality of the recently minted publicly traded partnerships has been decidedly mixed, with the launch of SouthCross Energy Partners LP (NYSE: SXE) and a handful of other names looking more like cash grabs than worthwhile investments. The past two years have also brought an influx of MLPs that pay variable distribution rates and operate in refining and other highly cyclical industries. Investors enticed by Northern Tier Energy LP (NYSE: NTI) and Alon USA Partners LP’s (NYSE: ALDW) supersized yields felt the pain when tightening price differentials crunched these outfits profit margins and forced them to slash their distributions. Meanwhile, the range of assets held by MLPs has broadened dramatically over the past two years. In part, this expansion stems from the recent upsurge in private letter rulings issued by the Internal Revenue Service (IRS) that respond to requests for clarification regarding which assets and activities generate qualifying income that’s suitable for this structure. Recent IPO classes brought the debut of SeaDrill Partners LLC (NYSE: SDLP), the first publicly traded partnership to own interests in offshore drilling rigs, and Hi-Crush Partners LP (NYSE: HCLP), the first MLP to manufacture and supply sand used in hydraulic fracturing. Expect forthcoming debutants to include a number of nontraditional MLPs. In this environment, investors must look beyond an MLP’s stated yield to the sustainability of its distributable cash flow and the company- and industry-specific risk factors. Investment banks and asset management outfits have also rushed to cash in on the MLP craze, launching 60 funds that allocate at least 20 percent of their assets to this security class. This level of institutionalization looks like overkill when you consider that the universe of publicly traded partnerships stands at 99 names after the recent IPOs of Western Refining Logistics LP (NYSE: WNRL) and OCI Resources LP (NYSE: OCIR). As we noted in MLP Investing: The Promise and Pitfalls of Fund Products, the performance of the actively managed MLP-focused funds–the offerings one would assume offer the most added value–largely have hugged or lagged the Alerian MLP Index. Given MLPs’ outperformance of recent years, the case could be made for some irrational exuberance on the part of investors. The Alerian MLP Index, an equal-weighted basket of the 50 largest energy-focused publicly traded partnerships, has generated a 247 percent total return over the past five years, easily besting the 92 percent gain posted by the S&P 500. And only 10 of the 99 publicly traded partnerships failed to hit a 52-week high this year. 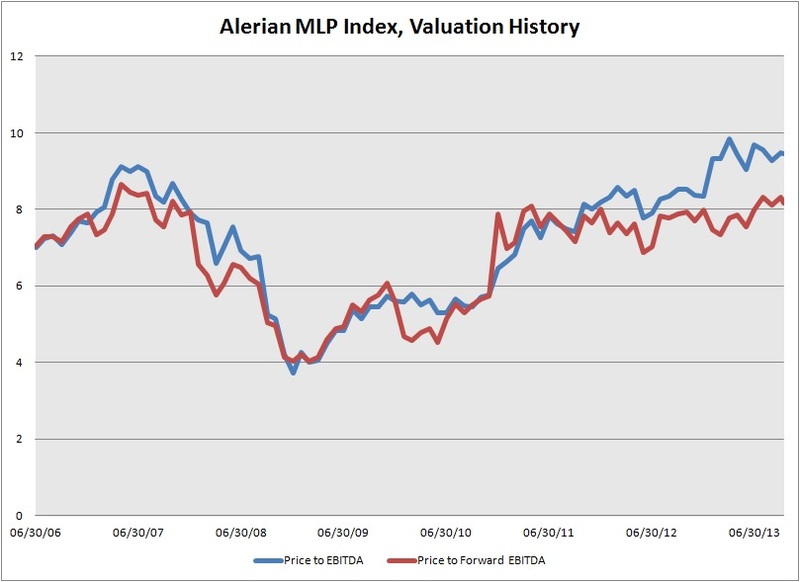 A look at the Alerian MLP Index’s price-to-EBITDA (earnings before interest, taxation, depreciation and amortization) ratio shows that the group commands a multiple that’s slightly higher than the previous high hit in 2007. However, when you consider analysts’ consensus forward EBITDA estimates, the index’s valuation appears more reasonable relative to historical norms. What developments would drive an across-the-board selloff in the MLP space? Investors’ biggest nightmare: A move by the federal government to end the group’s considerable tax advantages. In the near term, such a crackdown appears unlikely when you consider the importance of the MLP structure to financing the infrastructure build-out needed to support booming US hydrocarbon production and the American energy renaissance’s contribution to the domestic economy. Regardless of the legislative risk to MLPs, investors can take some simple steps to gird their portfolios against adverse federal action–or any other black swan. Rule No. 1: Your portfolio’s allocation to MLPs shouldn’t exceed more than 25 percent of your investable assets. Rule No. 2: Stick with names that can still thrive even if they’re taxed at the corporate level. Consider what happened after Canada amended its tax treatment of royalty trusts: Not one midstream name that converted to a corporation cut its dividend, thanks to their robust growth opportunities and remaining tax advantages. We would expect most pipeline-owning MLPs to hold their own if Congress were to repeal the structure’s tax advantages. Investors should focus on names with lower debt loads, secure revenue streams and elevated distribution coverage. Rule No. 3: Commit yourself to maintaining a balanced, diversified portfolio. Never allow a single holding to grow out of proportion to the rest of your portfolio. And don’t be afraid to take some money off the table in your biggest winners. Having a store of dry powder on hand for opportunistic stock purchases is always a good idea. With investors piling into MLPs and other groups that offer above-average yields, overpaying for income is a real risk. Investors should keep their eye out for several headwinds that don’t necessarily spell doom for MLPs but could weigh on further price appreciation and multiple expansion. With the Federal Reserve planning to normalize monetary policy gradually, fear of rising interest rates–the boogeyman that haunts all income-oriented fare these days–could soften unit prices and limit the group’s potential upside. At the same time, MLPs rely heavily on equity issuance to fund acquisitions and internal growth projects, raising concerns that the market won’t be able to absorb the growing volume of new common units. Favorable demographic trends should help to assuage some of these concerns, as a generation of baby boomers looks to convert accumulated savings into a reliable income stream. Meanwhile, the MLP space should continue to benefit from growing demand for critical infrastructure to support the US energy renaissance. A steady stream of potential acquisitions from private-equity firms looking to monetize their midstream (pipeline and processing assets), coupled with further consolidation, should also fuel growth. In the immediate aftermath of the 2008-09 financial crisis and market meltdown, investors enjoyed a stock-picker’s market–almost any stock you picked was destined to go up. 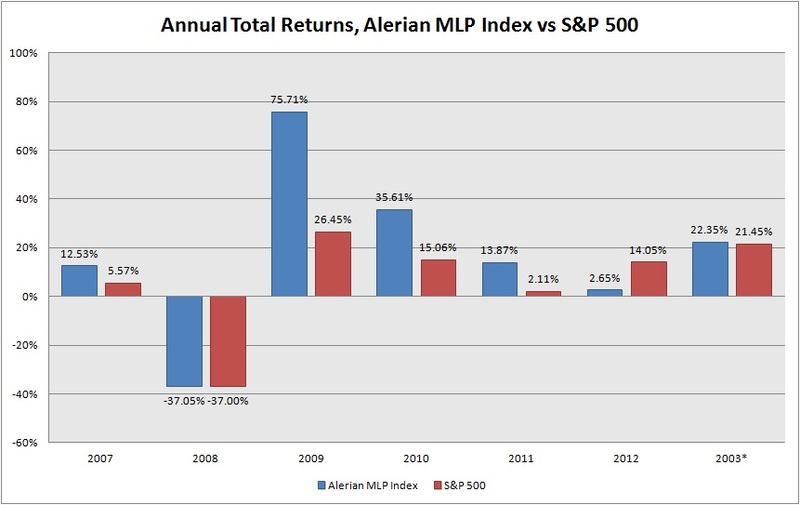 However, as the Alerian MLP Index’s recent annual returns demonstrate, selectivity in the MLP space has become increasingly important to outperforming the broader market. In this environment, valuation and potential will be critical to picking potential outperformers. Investors should pay particular attention to an MLP’s pipeline of growth projects and/or drop-down transactions, as well as names whose growth prospects might be underappreciated by the market. TransMontaigne Partners LP (NYSE: TLP), which we also highlighted as a potential takeover candidate, would meet these criteria. Understanding the extent to which a partnership’s distributable cash flow will fluctuate with hydrocarbon prices can help to identify the relative risk. Of course, you also need to pay attention to trends in commodity prices. For example, in recent years, the depressed price of natural gas liquids–especially ethane and propane–has emerged as a major headwind for some upstream operators and gathering and processing names that operate under percent-of-proceeds agreements. More recently, narrowing oil price differentials have crunched the distributable cash flow generated by CVR Refining LP (NYSE: CVRR) and other refiners. MLPs routinely tout the percentage of their distributable cash flow that’s backed by fee-based agreements–an important consideration. However, as the struggles faced by Navios Maritime Partners LP (NYSE: NMM) and other dry-bulk shippers demonstrate, investors must also pay attention to the re-contracting risk that an MLP faces. Even long-term contracts eventually expire; the likelihood of renewal and the new terms can dictate the sustainability of an MLP’s distribution. One area of potential re-contracting risk for investors to monitor: Speculatively built crude-oil storage in Cushing, Okla. With oil futures at lower levels than spot-market prices, demand for storage among traders has diminished. At the same time, increasing takeaway capacity at Cushing has reduced demand and pricing for storage at Cushing. Blue Knight Energy Partners LP (NSDQ: BKEP), which leases its storage capacity to traders under extremely short contracts, has the most near-term exposure to this risk.